Managed services make it possible to outsource the day-to-day technical management responsibilities and functions within a business. As a proven, strategic method for advancing operations and cutting expenses, businesses of all sizes are turning to managed services. Any of our service offerings can be customized and scaled up or down to meet the individual needs of any business. Take a look at our managed service offerings below. Managed IT Services is a way for organizations to keep their business technologies up-to-date with the latest versions without adding additional expenses. Enterprise-scale managed IT support helps businesses remove the added expense of purchasing, installing, maintaining and upgrading a complex IT infrastructure. As a solution, managed IT allows businesses to hand over the responsibility of infrastructure issues, connection problems and software downtime to a managed services provider. This leaves your internal department unburdened and able to focus on developing and implementing strategic initiatives capable of moving your business forward. 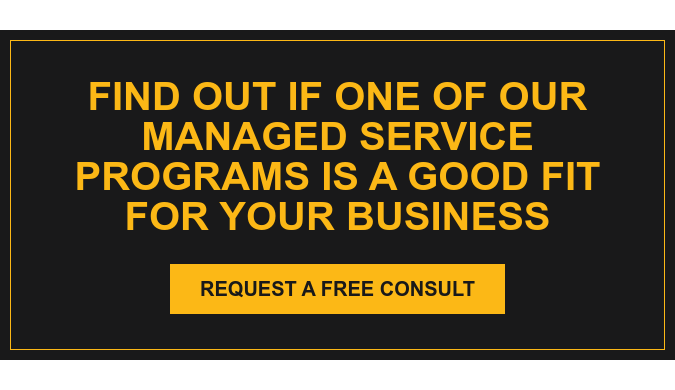 Managed Print Services is a program where a print provider manages all aspects of your business printing devices, including printers, scanners, faxes and copiers. By optimizing these devices, businesses save money, produce less paper waste and increase efficiency. Managed print solutions come in a variety of forms and can be tailored to your business' needs. Managed print services can reduce the workload of your IT department and as a result, increase their efficiency. Plus, managed print programs are partnerships that enable businesses to manage their printing environment more efficiently. Managed Wide Area Network (Managed WAN) is ideal for enterprise organizations looking to elevate the experiences of their end users without tapping into internal staff time or managing multiple service providers. Managed WAN solutions help organizations of all types and sizes - from retail companies and financial institutions to healthcare organizations and manufacturers - stay connected to their remote locations. Managed WAN delivers next-generation private data and internet connections to managed service customers. These services bring you high-speed connectivity, improved customer service efforts, staff satisfaction and efficient internal processes, without the headache of managing the solution. Managed Audio/Video services are all about helping your organization communicate more effectively. Staying connected with other employees and remote offices can feel like a struggle, but managed audio/video solutions make it possible. Systems can be set up to allow video conferencing from individual employee desks, other conference rooms and from offices in any other location. Everything is streamed in high-definition video and real-time audio. Managed Audio/Video solutions can encompass multiple screens, projectors, rooms and locations. We can also develop and implement individual workstation and/or mobile audio/video services. In my opinion, Marco has the highest quality and experienced technicians. They are efficient and friendly; they take care of us.